But it can't be from Dolly Clackett. She gave me an Easter egg! : Yeah, I WAS wearing makeup! I had a lightning bolt on my wanger! Yeah, I WAS wearing makeup! I had a lightning bolt on my wanger! Hello my lovelies! I hope you're all well wherever you are. It's beautifully sunny and warm here in Leamington, and Nic and I have just spent most of the afternoon in the park, which was lovely. Well, it would have been better without all the other people there but I'll try to be gracious. It is a public space after all. The unbelievably foul mood I was in on Wednesday did go away. Thursday and Friday were a bit better in the office, mainly because I was able to do some proper work. On Friday the head of my department called me to ask me to get involved in some planning work for a new project we might be taking on. It'll be good, I hope, because if it goes ahead it'll give me a chance to actually use my brain and my experience at work, and it meant a lot that she was keen to have me involved in it. We'll see what happens there, I suppose. I think that whatever happens, the next few months at work are probably going to be bumpy ones so I think the ups and downs will continue no matter what. As with my Corbusier Atlantis dress, I altered the straps so the dress isn't halterneck, as wearing a halterneck often gives me a headache. In fact, after these photos were taken I altered them further because they were a wee bit too long (I have narrow shoulders and they kept slipping down, which was annoying) This is an alteration I have to make a lot. Fun. Nic treated me to dinner from Millennium Sweet House before I went out to the cinema with Lauren to see Bridesmaids. 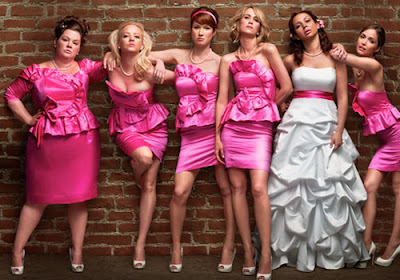 I don't go to the cinema as often as I ought to, given my background in film studies, but I had read a fair bit about Bridesmaids and was curious enough to want to see it. Also, there are so few films about women in the cinema now that when one comes along, I want to go and see it. Well, apart from Mamma Mia. I never want to see Mamma Mia. A lot of the reviews of Bridesmaids gave the impression it was like a female-centered version of The Hangover, which I think is unfair. It has its flaws, but I enjoyed Bridesmaids so much that I'm planning on going back to see it a second time. It's very, very funny but I wasn't expecting it to be so moving. The disintegration of Annie's life coninciding with mean girl friendship politics had me crying as much as John Hamm's performance made me laugh. John Hamm, though. That guy is FUNNEH. Seriously really, really funny. Rose Byrne's turn as bitchface Helen was especially affecting as well. We all know a girl like Helen - someone who can't wait to tell you how much better your friends like her than they like you, and tries to make you feel small. Then she cries that no-one likes her. Yeah, that. Bridesmaids. Not a chick flick. Check out the bitchface on Rose Byrne! After the cinema there was still time to catch Nic and friends in the pub around the corner for a drink (another reason to like the film, it wasn't ridiculously long like every other modern film. 2+ hours is too bloody long!) so ending the evening on a gin and tonic was just right. 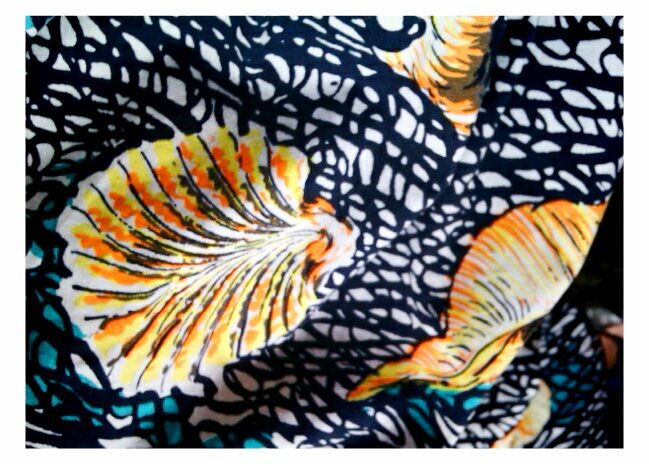 This is the second one of these frocks I've bought. The original came from the Phase Eight sale a number of years ago but was a size too big so I stopped wearing it and gave it to a friend. When it came up in my size on ebay last month I went for it! I usually find wrap dresses unflattering, they gape in the bust and tie in the wrong place, but this one works. It has a full circle skirt as well, so although I'm not wearing it with a petticoat here it accomodates one. This is my attempt to look sultry in sunglasses, but I look silly. The sunglasses are silly - I think they're very 70s footballer's wife, but I like them. On Saturday afternoon I went to hang out with Denise, we drank coffee, gossiped and iced cakes. You know how you do. My hayfever was bad on Saturday and I sneezed non-stop all day. I was mid-sneeze, halfway across Regent Street on my way to Denise when a stray gust of wind blew my skirt up and I flashed my knickers to some teenage boys. Seriously. I was too busy sneezing to do anything else. Luckily, I was wearing nice pants. Nic and I had been invited out for drinks to celebrate a friend's birthday, and after a rather large dinner I needed to change out of that wrap dress. The bow was constricting my tummy. Nice. We only planned to stay for one drink, but lots of nice people were at the pub, the sun was shining and the garden was pretty. We closed the pub, and it was about 4 am before Nic and I took ourselves to bed. I love impromptu nights out, especially where gin is involved. I was happily not hungover this morning and, as I said above, Nic and I passed the afternoon in the park. There was a free falconry display which was really interesting - although there was a bit of a hairy moment when one of the birds just didn't want to come back. The falconer was shouting for him for about fifteen minutes, which became increasingly surreal because the bird's name was Joe. It was one of those lovely, lazily sociable afternoons that has turned into a sleepy evening. I have my glass of wine and a DVD and I'm off now to enjoy the rest of my weekend. Before I go, if you'd like to check out a few vintage outfit shots, the lovely people at Fever Designs wrote this wee blog about me. I know I'm blowing my own trumpet, here, but go and have a wee look anyway. Good night my pretties!